The CIA invert is a one-dollar value postage stamp error issued by the United States Postal Service. It is one stamp from the Americana series that were produced between 1975 and 1981. 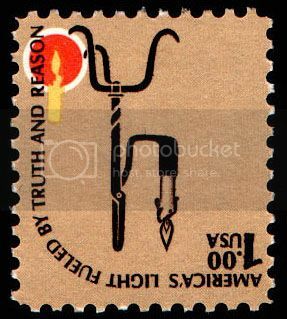 The $1 colonial rushlight holder stamp was first issued on July 2, 1979 and one sheet of 100 stamps was issued with the black (the last color printed, though it covers much of the stamp) inverted. The lamp candle holder and text are inverted relative to the flame. About 95 copies have been accounted for. The Scott catalogue number is: 1610c. This was the first United States stamp issued with a major design element printed upside down since the Dag Hammarskjöld invert error of 1962. One sheet of stamps was bought by a CIA employee who had been sent to the post office to buy some stamps. After the involved employees saved one each, the remainder were sold to a stamp dealer. The Government attempted to reclaim them, but was not successful because they had been legally purchased from a post office clerk. The involved CIA employees were ordered to return their stamps, some did, but others refused, and according to an April 2012 episode of Burt Wolf: Travels and Traditions detailing stamp collecting around the world, these employees were fired. Stamp catalogs list its price as only $15,000; one tenth of the Inverted Jenny that is valued at $150,000 yet about the same number of each stamp exist. A block-of-four stamps sold in 2004 for $60,000. In September 2006, reproductions have been sold on eBay.